In 2015-16, Australia’s Aid Program will be around A$4 billion, which is less than half the size of what it would have been if the bipartisan promise to reach 0.5% of GNI in 2015 was kept. The cuts to the aid program over the last three years have disproportionally affected the world’s poorest countries, with aid to Sub-Saharan Africa to fall to less than 10% of the level it was promised to be. Only the Pacific and countries that Australia has a refugee processing deal with have been spared the bulk of the cuts, as aid to the Pacific is still set to be almost 60% of the level originally promised. Three years ago the Australian Government released a blueprint for the bilateral aid program in 2015-16 disaggregated by region. The plan was for a geographically diverse aid program that had a presence in the world’s poorest countries, while still clearly prioritising Australia’s immediate neighbourhood. However these spending promises have failed to be fulfilled. 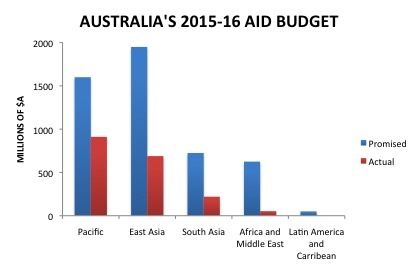 Instead, Australia’s aid program almost exclusively focuses on the Pacific and some nearby countries in East Asia. The chart below shows that Africa and the Middle East as well as Latin America and the Caribbean have disproportionally suffered from the aid cuts since 2012. Potentially one of the most concerning aspects of the retreat of Australia’s Aid Program from its trajectory three years ago is the shift away from the world’s poorest countries. As discussed in this blog, Australia’s aid program was already dramatically disproportionally skewed away from the world’s poor. The latest round of aid cuts is set to exaggerate this imbalance even further. 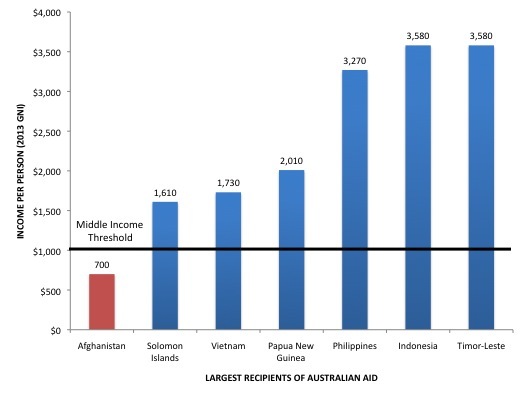 How Generous an Aid Donor is Australia? Australia is not one of the most generous aid donors in the world (using 2012 data, the most recently available year for international comparison). 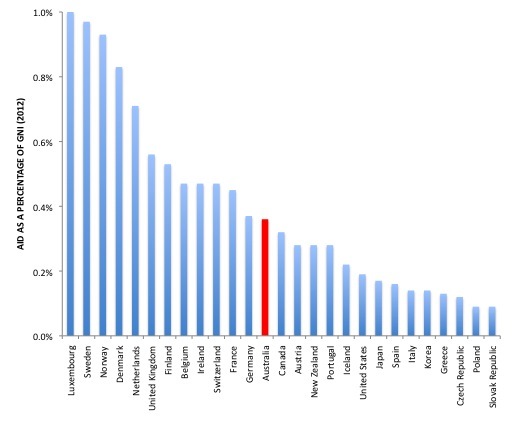 The most accepted measure of aid generosity (aid as a percentage of GNI) ranks Australia around average. 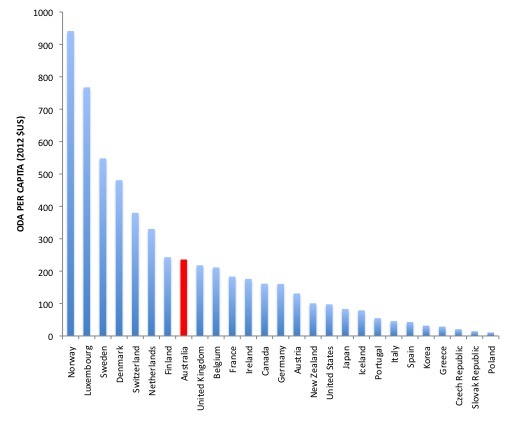 Even in per capita terms (the measure frequently used by the Australian Foreign Minister), Australia is barely in the top third. Since 2012, $4.5 billion worth of aid cuts have been announced by the new Australian Government, which will make Australia considerably less generous. The Australian Foreign Minister has repeatedly made the claim that Australia is ‘one of the most generous aid donors in the world in per capita terms’, however this is simply not the case. Traditionally aid as a percentage of GNI is used to rank donors in terms of generosity. This measure accounts for the size of a donors’ economy. As such it factors in that Australia is one of the richest countries in the world. 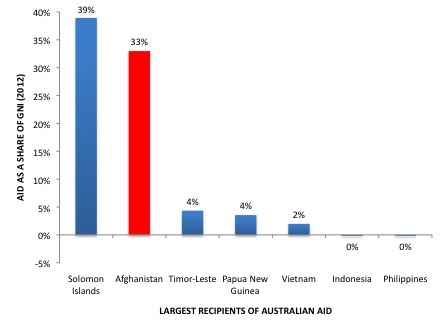 The chart below ranks aid donors in terms of aid as a percentage of GNI and it shows that Australia is around average. Even using the measure often sited by the Australian Foreign Minister, aid in per capita terms, Australia barely ranks in the top third of donors. The chart below shows that using this measure Australia is still far behind the most generous donors in the world. Australia’s international ranking in both of these measures of aid generosity is set to decline as the Australian Government cuts the aid budget by $4.5 billion. Therefore no matter how you present the data, the evidence is clear: Australia is not one of the most generous aid donors in the world and is set to become even less generous. The Australian Government’s commitment to further focus the Australian Aid Program on East Asia and the Pacific will shift funds away from the vast majority of the world’s extreme poor. Over three quarters of Australia’s Bilateral Aid goes to East Asia and the Pacific, however the region is home to less than 10% of the World’s extreme poor (excluding China). This is in stark contrast to Sub-Saharan Africa that receives only 5% of the Bilateral Aid Budget but is home to over a third of the World’s extreme poor. By 2030, over two-thirds of the World’s extreme poor will live in Sub-Saharan Africa (according to World Bank estimates). While less than 2% of those in extreme poverty will remain in East Asia and the Pacific. Extreme poverty has reduced significantly at a global level over the last twenty years, however some regions have faired much better than others. Extreme poverty in East Asia and the Pacific reduced from almost one billion people in 1990 to 250 million in 2010. 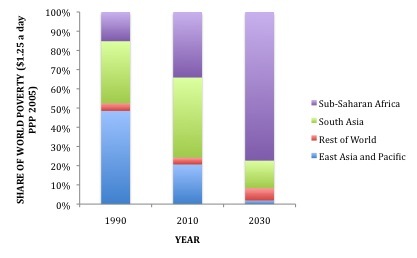 This trend is projected to continue and by 2030 the region will only have around 10 million people remaining in extreme poverty (according to World Bank estimates). The extreme poor will become increasingly concentrated in Sub-Saharan Africa. The number of people living below $1.25 a day in the region increased from 290 million to over 400 million between 1990 and 2010. This is set to increase to almost 500 million by 2030 making Sub-Saharan Africa home to over two-thirds of the world’s extreme poor (according to World Bank estimates). This shift in the geography of extreme poverty is shown in the chart below. At the same time the Australian Government almost halved Aid to Sub-Saharan Africa in the recent budget update and indicated that this will continue. Sub-Saharan Africa receives only around 5% of the Bilateral Aid Budget although it is home to over a third of the World’s extreme poor. While East Asia and the Pacific receive over three quarters of the Bilateral Aid Budget, even though the region is home to less than 10% of the world’s extreme poor (excluding China).